Once upon a time, we knew what painting was. 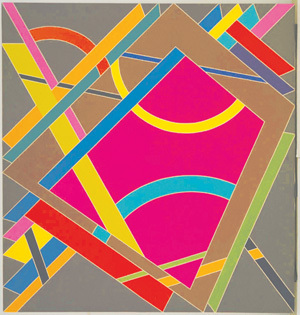 As recently as the 1960s, there was, if not a single consensus, then at least several broad and overlapping consensuses about what constituted a painting: It was two-dimensional and used pigments on some type of support, like a canvas; it was abstract, or it was representational; it was defined by its medium and sought to exclude the influence of all others, or it was defined by how prettily or truthfully it employed its medium, etc. The delightful proposition of "What Is Painting?" � a broad survey of art from the 1960s to today, drawn from the Museum of Modern Art's contemporary collection � is that we have utterly lost our way: We no longer have any idea what painting is, and we are much better for it. Loosely chronological and with an equally relaxed thematic structure, the show makes its argument largely through the variety and quality of the work on view. "This fine exhibition insouciantly suggests a painting is not what we are used to, not what we expect, but rather, whatever we can get away with". Yeah, we know. They have been doing nothing but suggesting that for some decades now. And therein lies the problem. Gramsci (the commie demoralization expert) placed great importance on fellow travelers in the gov't using grant money to put ugly, meaningless art into western public spaces. It's true--look it up. Fine art has never known what its purpose is. There was church art (a form of illustration) and there was non-church illustration for decoration but, since photography, we have illustration and .... what? True. Since photography. But I have often wondered if the present condition was caused by the advent of photography - or was it something else? I remember Kenneth Clark saying that for 2,500 years, beginning with the Greeks, the human form had been at the center of art, and now once again it no longer is - and we don't know the full consequences of its not being there. Somehow even classical music has more of a discernable human form in it than the modern. I mean, can cerebral artists like say Philip Glass ever directly probe human emotions as did any number of the old 18th/19th century longhairs? "Much better for it" I wouldn't look at the junk produced by modern art by "artists" who can't draw, dribble paint all over the place, and create things that nobody can figure out what it means. I am waiting for the day that creating beauty becomes the reason for art, again. Right now, all that seems to matter in art is how clever, insulting the bourgeoisie, or political an artist can get. I would still rather see a Winslow Homer over a Jackson Pollock, anyday. Winslow Homer is one of my absolute favorites. The watercolors from the north woods lake country especially.